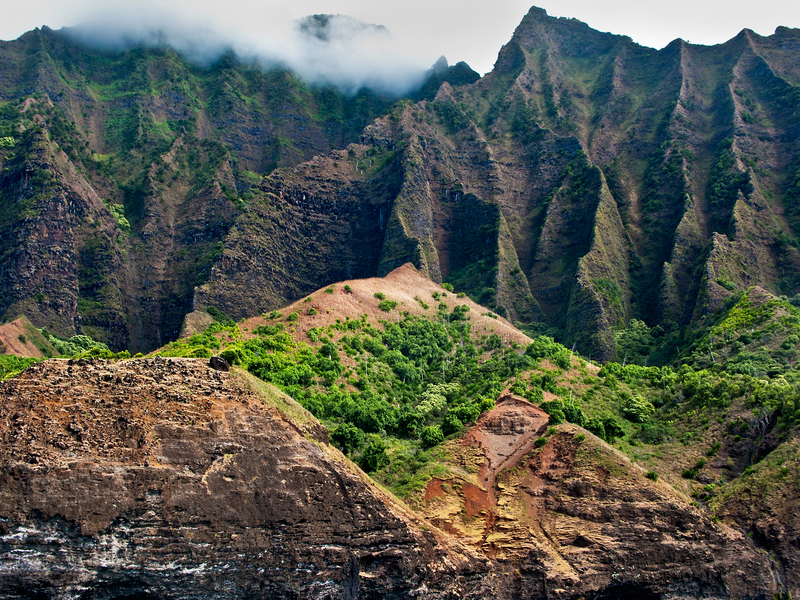 The northwest side of Kauai is home to the island’s Na Pali Coast. Na Pali (which means “the cliffs” in Hawaiian) is a 16 mile stretch of coastline made up of sharp spires and staggering cliffs that rise as high as 4,000 feet above the ocean. There are three ways to see and photograph Na Pali: by hiking the famous (and treacherous) Kalalau trail, by helicopter, or by boat. I’ve shot the Na Pali from a helicopter twice, and had mixed luck on the Kalalau trail. So this time, I opted for the boat ride. A boat tour of the Na Pali takes 4-5 hours, but provides an whale’s-eye view of the many sea caves, valleys and waterfalls that are difficult to access by helicopter. Unfortunately the downside of viewing Na Pali by boat is that the surf can be rough and unpredictable. After reading warnings on various websites from drenched passengers, I opted to leave my medium format gear behind and shoot with a Canon G9 – which did a pretty good job for a compact camera. See my Kauai gallery for all the photos.